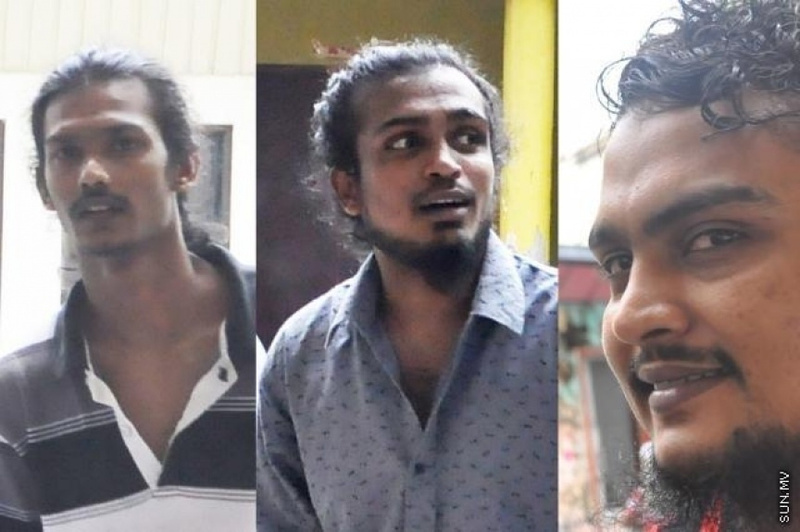 The three suspects in Nizaar's death who were transferred to house arrest after 4 years on 24 May 2018. The three people charged with terrorism in the death of Ahmed Nizaaru, Laamu Gan) has been transferred to house arrest after nearly five years in prison. Their transfer came during the hearing held at the Criminal Court today. As for the reason for the transfer, the Judge said that it was because evidence testimonies have been taken and poses no opportunities for the suspects to influence any evidence against them. Ahmed Nizaaru was killed on the night of 14 July 2014 around 2:23 a.m. as he was going north on the Gan industrial road near the Dhiraagu antenna area in an attack by the three suspects and others who used a piece of wood. Initially, the agenda for today's hearing had closed testimonies of two witnesses but it was changed to 7 June after a recess of 15 minutes. The Judge said that if the witnesses fail to come forward at the next hearing, no more opportunities would be given and move on to defence witnesses.